Innovation Week 2017 is the 2nd annual week-long celebration of the entrepreneurial, investment, employment, and technological opportunities in Burlington and Vermont. “Innovation Week, October 13-21, 2017, is a series of events that highlights the vibrant energy of greater Burlington’s entrepreneurial, technological and creative ecosystem. 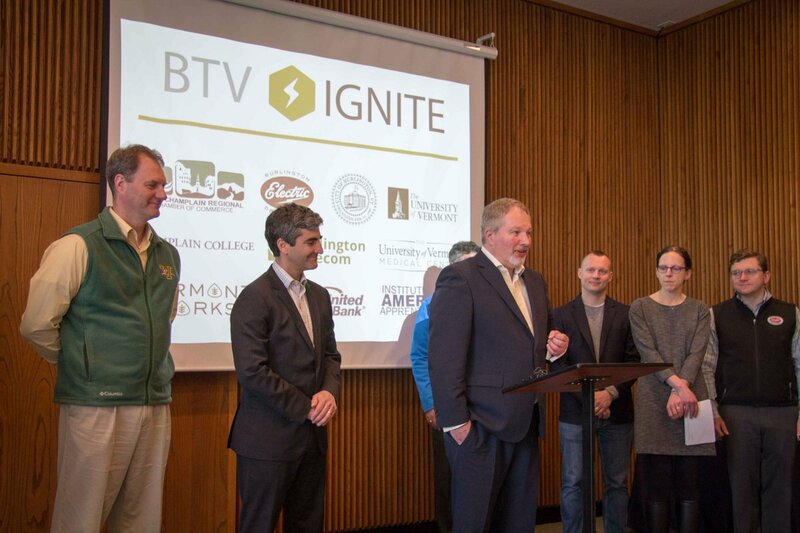 Powered by BTV Ignite and its partners, this second annual weeklong celebration of engaging events has something for everyone who loves what Burlington IS — and what it can be! The week begins with the seventh annual Hack VT, a 24-hour hackathon in which teams compete to build apps that help the state of Vermont, and ends with the 11th Seven Days Vermont Tech Jam, a two-day job fair and tech expo showcasing some of the area’s most exciting employers and their products, along with K-12 student projects displayed in a school mini maker faire. Each day in between is filled with events to spotlight the vibrant innovation landscape in the Burlington region. Presentations and demos will feature innovative start-ups that have chosen to launch and grow in Burlington, creating greater opportunity to invest, study, and work in the area. Registration for all events is FREE. This year’s keynote event, Burlington Gigabit City will be held on Tuesday, October 17 at the UVM Alumni House and will feature presentations by Bill Wallace (US Ignite CEO), Michael Schirling (Vermont Secretary of Commerce and Community Development), Dennis Moynihan (BTV Ignite Executive Director), and Jill Jemison (UVM College of Medicine Director of Technology, BTV Ignite Technical Leader).